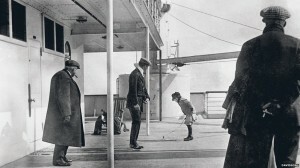 This father and son shown on the deck of the Titanic were preserved in this photo by Father Francis Browne who disembarked from the ship in Ireland, thus saving the only photos from the ship while it was at sea. This is one of but a few actual photos taken while the Titanic was at sea. This and others were taken by Father Francis Browne who had been given a ticket for the voyage between Southampton and Ireland by his uncle, a Catholic Bishop as a graduation present upon completing the seminary. Upon arriving at Ireland, Father Browne wired his uncle and asked permission to continue on to New York. The reply was “get off that ship now”. The priest had to turn down the offer from some wealthy Americans who were going to pay for him to travel to New York and back and he left the ship at Queenstown, Ireland. He had one other present with him on the trip and it was the camera he used to take this photo. 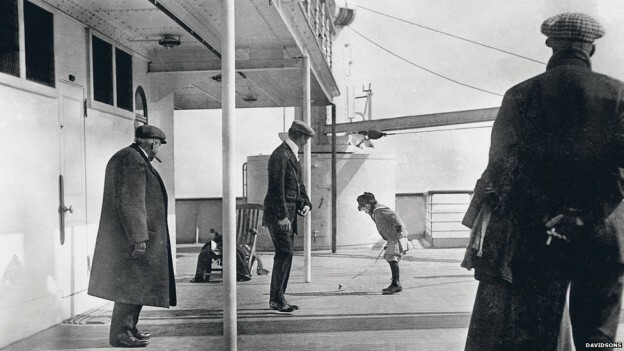 By obeying his uncle, he also preserved for generations to come the only photos taken on board the Titanic while it was at sea. What was the fate of the father and son shown here? They both survived the sinking but within a couple of years both met tragic deaths. 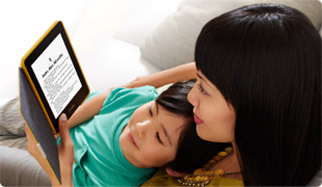 Brand New Kindle Paperwhite or $119 Amazon Gift Card will be given away on April 15th. Pick up a copy of my book, TITANIC 1912 at Amazon. You will be able to learn more about how the newspapers of the day reported the story of the sinking of the great ship, how they got the story right and how they got it wrong. There are plenty of books describing the disaster itself, this one tells the story from the news reports and first interviews with the survivors themselves…along with the astonishing story of how the ship was actually on fire from the time it left Southampton.